We are back with yet another edition, with a list of herbs that can be of very limited/no usage during pregnancy. Mother Nature is a wise woman, and her herbs and plants can alleviate plenty of ailments. However, when you're pregnant, you need to be extra careful about what supplements you take and what herbal drinks you consume. Herbal supplements that were perfectly safe for you before pregnancy might cause pregnancy complications or harm your baby. Herbs are all-natural, but natural is not synonymous with safe, especially when you're "with child." This list refers to medicinal and not culinary uses of herbs. Keep in mind that even herbs that are on the "avoid" list are safe to eat in food, because of the small amount you consume, even if you eat it in several meals a week. Unlike over-the-counter and prescription medications, herbal supplements aren't subject to the same evaluation process and extensive research. Because of this, the efficacy, strength and quality of a supplement can vary significantly between brands, and consumers can't always be certain they can trust what is written on a label. According to a National Institutes of Health spokesperson, the trouble with herbs and supplements is that they haven't been studied at the level that pharmaceutical drugs have--especially in pregnant and lactating women--and there is no comprehensive source on the efficacy and safety of herbs during pregnancy. Here's a list of herbs you should avoid when you're expecting. But please note: Always consult your health-care provider before you begin taking any supplement, herbal or otherwise. Coffee: avoid caffeine, as it irritates the uterus; excessive amounts in some sensitive individuals can cause premature birth or miscarriage. Eucalyptus oil: This oil should be avoided during pregnancy as it is difficult to eliminate through the kidneys. Wild Ginger: Wild ginger contains 2.5% volatile oil, which comprises such terpenoids as methyl eugenol, borneol, linalool, geraniol, and pinene. Other compounds include a pungent resin, starch, gum, a fragrant principle called asarol, and traces of a fixed oil. Conflicting reports exist on the effects of certain terpenoids (citral, linool) on hepatic metabolism. Rose Hips: Rose hips contain significant vitamin C, tannins, pectins, and carotene (carotenoids). A natural source of vitamin C rose hips has been claimed to be useful as a laxative, capillary strengthener, and boost to the immune system to prevent illness. However, studies have shown adverse reactions like diarrhoea, skin irritation and allergic reactions, and hence its best avoided during pregnancy and lactation. Wild Yam: Wild yam contains steroidal saponins, diosgenin, dioscenin, DHEA, phytosterols (beta-sitosterol), alkaloids, and tannins. It is most noted for its component DHEA. Wild yam is claimed to be useful in treating abdominal cramps, and menopausal symptoms. Wild yam was historically the sole source of raw materials for manufacturing contraceptive hormones, cortisone, and anabolic hormones hence making it unsafe to be consumed during pregnancy. These are among the most commonly used herbs which do not have enough scientific data to be used as medicinal herbs, though they are used as culinary herbs. 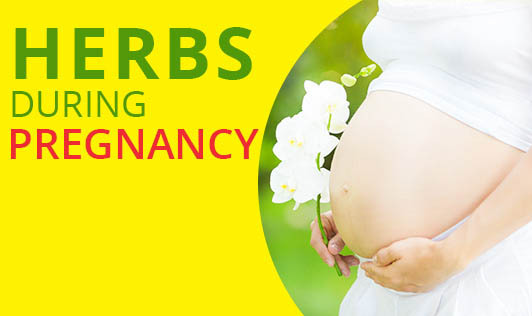 The above mentioned herbs are contra-indicated during pregnancy for the reasons mentioned. Be it herbal remedies or otherwise, always consultation with a Physician prior to usage is highly recommended. Hoping this information on herbs has helped; let us catch up with yet another interesting topic next time.